You've gone to a great deal of trouble and expense to acquire an amazing costume that shows off your figure to best advantage. But don't forget to do something appealing with your hair, too! If you step onto stage wearing the same ordinary, everyday look that you would wear to the office, then you'll lose some of your impact. At the same time you're planning your new costume, plan ahead for the hair accessories you will wear with it. Purchase either extra fabric or extra trim to use in creating these finishing touches. With every style shown in this article, it's very important to wear it for several practice sessions before you attempt to try wearing it in public. You need to make sure you've secured it sufficiently to prevent having it come loose during a performance. The only way to be certain is to practice, practice, practice before you wear it in public. This versatile scarf can be worn a number of different ways. Instructions on how to make it appear elsewhere on this web site. This look works well for dancers with high foreheads. Worn this way, it keeps your hair out of your face while you dance. It also prevents perspiration from running down your face and smearing your eye makeup. Take the center of the scarf into both hands, and gather it to about half the width. Place the gathered portion across the upper part of your forehead, so the scarf is right against your hairline. Photo by John Rickman Photography, San Jose, California. Click on it to see more detail. Now pull the scarf around each side and tie it in a square knot securely in the back, directly behind your head, so that it's level all the way around. You'll end up with the scarf on top of your hair. Next, run either your finger or a tail comb across the upper edge of the scarf to pull the hair out from under it. Lay that hair over the scarf so that the hair covers it all the way around, except for the center front at the forehead. Let the tails of the scarf hang down in back so they can be seen from under the hair. If you have bangs, pull them out from under the scarf if necessary. Style them as you see fit. For a variation on this look, place the knot on one side of your head, above the ear, instead of in center back. This will have the tails of the scarf hanging down to your shoulder on one side. For another variation, make three of these scarves, each in a different color. Braid them together, and secure each end with a rubber band. Then put the scarves on as described above. As soon as you're done dancing, remove the rubber bands and undo the braid, to prevent the scarves from wrinkling. Smooth them out flat before putting away. This "I Dream Of Jeannie" look keeps your hair out of your face while you dance, and also keeps the back of your neck cool. Pull your hair into a ponytail at the crown of the head and secure it with a rubber band. Wrap the scarf around the base of the ponytail a couple of times, then tie it. When wearing a ponytail, it's important for your makeup to be perfect because this hairstyle calls attention to your face. To make the look complete, wear a coordinating pair of earrings and a necklace to add sparkle around your face. Instructions to make earrings like these appear elsewhere on this web site. For another variation, wear this scarf like a headband. Wrap it across the top of the head and over each ear. Tie the knot at the nape of the neck, under the hair. Photo to the right is by William M. Smith, Iowa City, Iowa. Click on it to see more detail. Purchase an inexpensive plastic headband at your local drugstore like the brown one in the photo to the right. Cover it with fabric that matches your costume and decorate with beads and sequins. Or, glue beads and sequins directly to the plastic as shown in this illustration. To wear, place it in your hair the way you normally would wear any other headband. If you prefer a more earthy aesthetic, instead of decorating the headband with beads and sequins, try using cowrie shells, coins, peacock feathers, bits of semi-precious stone, small mirrors, or other ornaments that coordinate with other parts of your costume. Photo by William M. Smith, Iowa City, Iowa. Like the ponytail, this style keeps your hair out of your face while you dance and keeps the back of your neck cool. But it looks a little more elegant than a ponytail. Purchase a plain plastic banana clip at your local drugstore such as the brown one shown to the right. Glue decorations to it that match your costume. 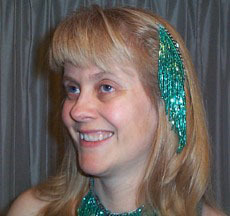 For a sparkly look, these could be beads and sequins, such as the teal and silver example in this photo. I have one that I purchased which features lilac-dyed feathers. For a more earthy aesthetic, try tiny shells, semi-precious stones, brown feathers, or ethnic fabric. To wear it, draw your hair back into a ponytail centered at the point halfway between the crown of your head and the nape of your neck. Use a rubber band to temporarily fasten it in place. Position the clip so that the hinge is just above the nape of your neck — if you tilt your head back, the end of the clip should not dig into your neck. As you close the clip, try to press its teeth against your scalp so that the clip will lie as close to your head as possible. Fasten the top edge of the clip in place, then remove the rubber band. Photo by John Rickman Photography, San Jose, California. Click on the photo to see more detail. 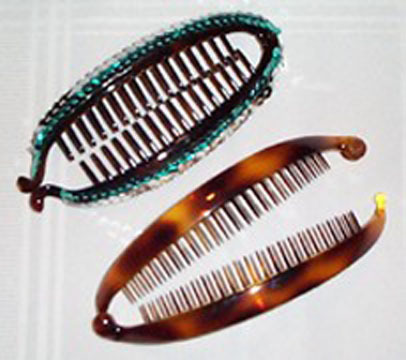 If you want to wear your hair loose, but keep it away from your face, you might consider using hair combs. Purchase an inexpensive plastic comb such as the clear one to the right and glue decorations onto it. For a sparkly look, try glass beads, crystals, rhinestones, or sequins. For an earthy aesthetic, try feathers, semi-precious stones, ethnic fabric, the type of sisal twine sold for making jewelry, or tiny shells. Although the decorated one in this example has beaded fringe on it, I don't recommend using beaded fringe. I find that the weight of the glass beads makes it difficult to keep the comb in place while I'm dancing. If you like to part your hair down the middle, you can wear two combs, one on each side, which is what I did for the above photo. If you prefer to part your hair on the side, try wearing a single comb on one side. Photo by William M. Smith, Iowa City, Iowa. Click on it to see more detail. A beautiful belly dancing costume can make you feel like a queen. So why not top it off with a crown that matches your costume? 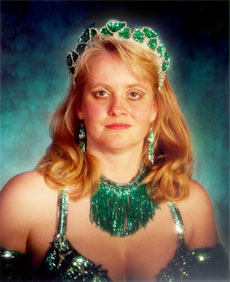 This particular fashion entered the belly dance scene from Egypt. Crowns of this style were popular among dancers there for a few years in the late 1990's and early 2000's. Although they have since fallen out of fashion in Egypt, some dancers in other countries still enjoy wearing them. The photo to the right is by John Rickman Photography, San Jose, California. Click on it to see more detail. I purchased the crown in this photo when I was in Egypt. However, you could easily make one of your own. Ask the staff at your local fabric store to help you find the buckram. This is a very, very stiff material often used in making hats. Purchase about 3 times more than the size of the headdress you want to make. Cut out 3 or 4 pieces, all the same size and shape, and stitch all together to make a single piece that is several thicknesses. Decorate with beads, sequins, or sequinned appliqués to match your costume. Or, if you prefer an earthy aesthetic, try covering it with an ethnic textile and decorating with tiny mirrors, shells, or semi-precious stones. Another way to make it: instead of using buckram, cut a piece of sturdy cardboard in the desired shape. Make a slipcover of fabric that will completely cover the cardboard. Before securing the fabric in place over the cardboard, decorate it as desired with beads, sequins, and appliqués. If necessary, attach it to an inexpensive plastic headband to keep it on your head. I got this idea from Morocco in New York City. For a dancer with very short hair, it can give the illusion of having longer hair. For others, it provides a dramatic change of pace from our everyday styles. When dancing with a shamadan (Egyptian candelabrum), a snood can protect your hair against dripping wax. It is easier to clean a snood than to remove wax from hair! 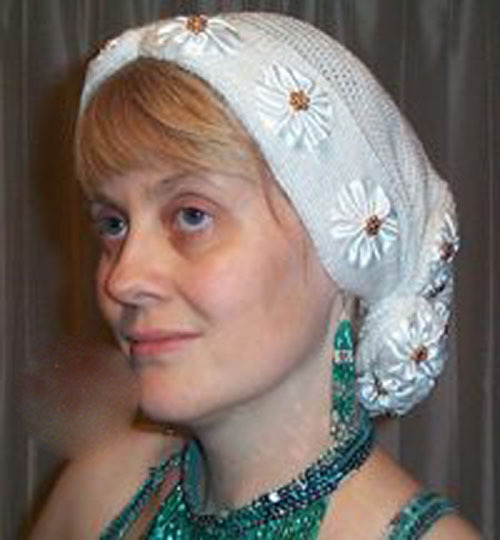 A dancer whose hair is waist-length or longer could put her hair in a braid, coil it up into a bun, and then wear the snood over it all, which gives the illusion of shorter hair. This photo of Morocco appears on this web site with her permission. I purchased the snood shown in this photo when I was in Cairo in 1999, exploring a small shopping center that was frequented by the locals. So, this accessory is something that "real" Middle Eastern women used to wear. The style is no longer in fashion in Egypt now, but the look could still be adapted to dance costuming. You can make your snood of fabric if you wish, with an elastic band on the edge to help hold it to your head. Sew beads or sequins on it to make a design. Or, if you're handy with a crochet hook, you can make one out of glittery yarn. Before beginning your starting chain, string a large number of beads onto your hook. As you crochet, periodically slide a bead into position and lock it into place when you make the next stitch. To wear your snood, gather your long tresses into a bun at the back of the neck and slide the snood onto your head. The bun doesn't need to be tidy because the snood covers it. Use bobby pins to secure it. If you have very thin hair and the bobby pins have difficulty holding the snood in position, gather bits of your hair into tiny ponytails along the line where the elastic band goes, and then secure your bobby pins into those tiny ponytails. The snood will cover them. 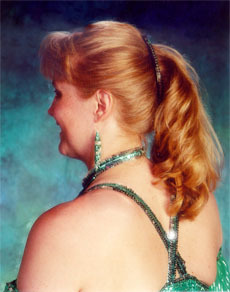 This is another style that can give a short-haired dancer the illusion of having longer hair. I like to wear one of these if I'll be balancing a sword on my head in an outdoor performance, because it prevents a brief gust of wind from blowing the sword off my head. You may be able to find one of these headdresses at your local theatrical shop, or through your favorite belly dancing vendor. Or, if you know how to crochet you can make one. Instructions for making one appear elsewhere on this web site. 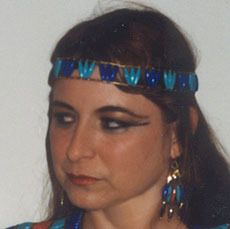 Many of the Egyptian lycra costumes come with a headband made out of the same fabric as the dress or skirt and decorated to match. You could make your own out of stretchy fabric and appropriate embellishments to coordinate with the rest of your costume. 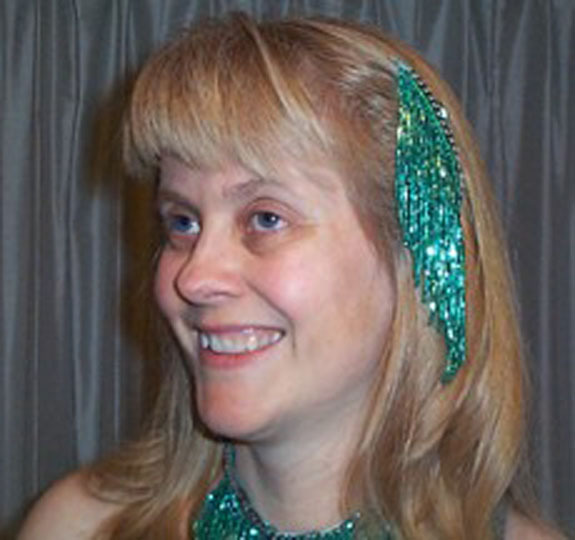 For a sparkly aesthetic, embellish with glass beads, sequins, and crystals. For an earthy aesthetic, embellish with small shells, silk flowers, small mirrors, or coins. Photo by Lina Jang, New York City, New York. Click on it to see more detail. 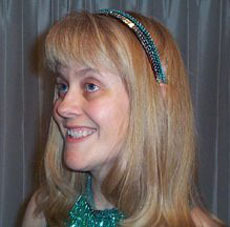 A simple beaded headband can be worn around the forehead, as Arabella shows in this photo. She has teamed hers with matching earrings, wristbands, collar, and dress. Although Arabella has long hair, this headband could also look attractive with a very short hair style. Instructions to make the complete ensemble appear elsewhere on this web site. Click on the photo to see the headband in more detail. Learning to Style Your Hair, Part 1. Go to your hairdresser the day before a show and have him/her give you a style especially for the show, complete with lessons on how to duplicate it yourself at home. You may want to repeat this 3-4 times, until you can reproduce the style on your own with confidence. Learning to Style Your Hair, Part 2. Ask a friend who is accomplished with styling hair to give you a lesson. Learning to Style Your Hair, Part 3. Buy a book on styling hair. One that I found helpful is Hair: A Book of Braiding and Styles by Anne Johnson. Dafne Canales is from Calgary, Alberta in Canada. For Instant Drama. Wear a wig or a hairpiece. To ensure it stays on securely and doesn't fall off while you're dancing, make sure you completely understand how to attach the wig or hairpiece to your own hair before you leave the salon or store you purchased it at. 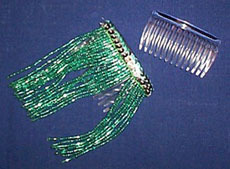 Ask the person helping you to attach some extra clips to keep the wig or hairpiece/extension on securely. This should be a minimum of four. Keeping Your Hair On. Your wig or hairpiece will stay on more securely if the clips are sewn onto it and not glued on. Banana Clip. If you decide to wear a hairpiece or hair-extension with a banana clip, try to get one that crosses at the top instead of one that just clips onto itself. If you find a hairpiece that you like with a non-crossing banana clip, ask the person helping you to remove the current clip and insert a new one that does cross. Don't let them tell you this can't be done because it can and it's worth paying the extra money for it. Curling Wig Made of Natural Hair. You can curl a wig made of natural hair the same way you would curl your own hair, so the wig is very versatile. Get A Good Price. Look for sales at the wig places. I was lucky enough to find a $150 wig on sale for $30, so shop around. Ask The Costume Goddess: Headdresses. 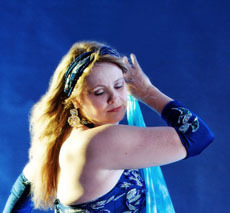 Suggestions for headdresses to accessorize belly dance costumes. Ask The Costume Goddess: Hair Styles For Short Hair. Ideas for short-haired dancers. Ask the Costume Goddess: Hair Styles for Long Hair. Ideas for long-haired dancers. Making an Egyptian Pharaonic Costume. By Arabella. 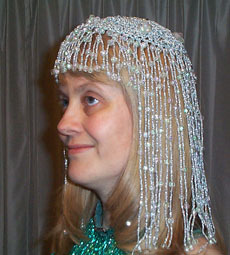 Includes instructions for a beaded headband. How to Make a Cleopatra Headdress. Shira provides instructions for crochet. How To Make A Rectangular Head Scarf. Shira describes how to make a small rectangular scarf. How to Make a Triangular Head Scarf. For folkloric styles of dance. The Costume Goddess Tells All: Headpieces for Bellydancers. Review of book by Dina Lydia.